CivilizationByzantine / Armenian, Medieval , 900 C.E. - 1200 C.E. ConditionOverall in fair and sound condition. Four leaves from an extremely early Biblical codex. 4 leaves, with one complete leaf and a lower half (bisected horizontally across the page) from an early Armenian translation of John 10-11, the complete leaf 320mm. 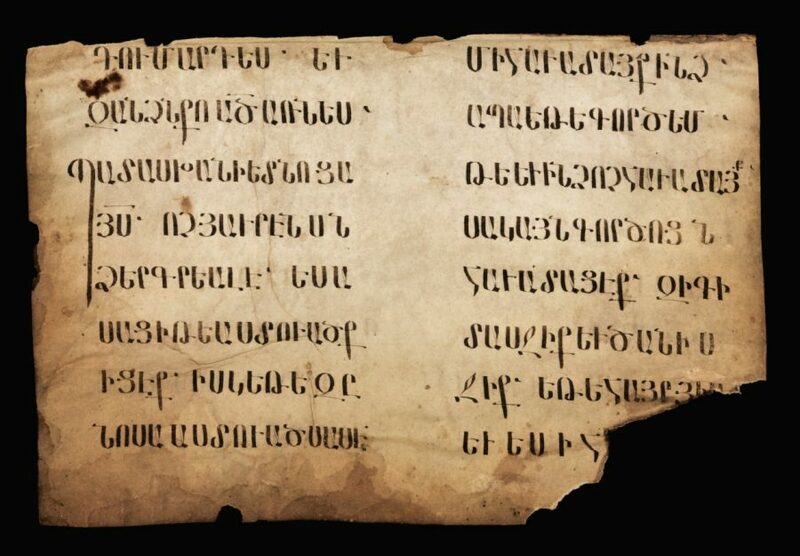 by 230mm., double column, 17 lines in dark brown ink in large and imposing erkat’agir majuscules (the so-called ‘Iron Writing’, the earliest Armenian script to survive in manuscript) with capitals with long trailing descenders, notably similar to British Library, Add. MS.21932, trimmed to edges of text, Armenia, probably ninth or tenth century; plus the lower half of a leaf from a Biblical or liturgical manuscript, 200mm. by 135mm., with remains of double column, 12 lines in light brown ink in a smaller and squarer hand closer to that of Dublin, Chester Beatty MSS.554 and 556, both twelfth century (Catalogue of the Armenian Manuscripts, 1958 II: pls.1 and 4), Armenia, probably twelfth century; all leaves recovered from bindings and with stains, tears, folds and later pen-trials and notes, but overall in fair and sound condition.